Frequently Asked Questions | How much do Segways cost? Q: How much does a Segway cost? A: Brand new second generation Segways costs roughly $7,000 after taxes, and used second generation Segways cost between $4,000 and $5,000 depending on condition. Q: What is the price for a tour? 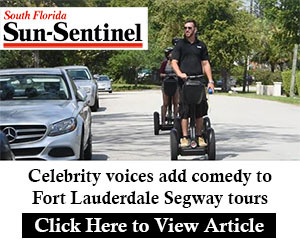 Click Here to watch a video of our Fort Lauderdale tour! Q: What are the tour times? A: Everyday by reservation only. No specific times, just any time between our hours that is available. Boca Raton and Fort Lauderdale runs from 8 a.m. until 6 p.m., and Hollywood runs from 7 a.m. until 11 p.m.
Q: Is there a throttle on the handle bars? A: Or how does the Segway work? It’s a self-balancing machine, meaning you go forward by leaning and putting weight on your toes, and you stop by just leaning back and shifting your weight to your heels. Q: How fast does a Segway go? Q: Does it run off battery or gas? A: How long does it take for the battery to charge? The battery lasts about 25 miles fully charged, and it takes about 4-5 hours to recharge. A: Yes, after our hands-on training you will be a pro! Q: Does it go backwards? A: Yes, but there is no need to do so. The Segway has a 0 turning radius, meaning you can turn around without moving forward or backward. Q: Can more than 1 person ride on a Segway? Q: Can you ride the Segway in the rain? A: Yes but we only ride in a light drizzle. Q: What are the rules regarding where you can ride? A: FL. Statute 316.2068 allows you to ride in 25 mph speed zones or less, sidewalks, and bike paths as long as you are cautious of pedestrians and give them the right of way. Q: How do we accept payment? A: Cash or credit card, no amex. Q: How much does a Segway weigh? These facts were awesome in helping me to choose to do a segway tour!!!! glad you found it helpful Alexander!